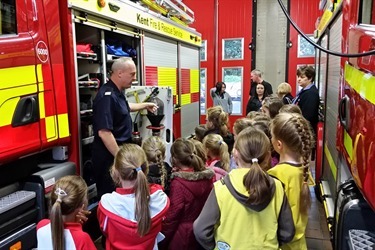 Girls from 1st Milton Regis Rainbows and 6th Milton Regis Brownies enjoyed a tour of Sittingbourne Fire Station recently where they were shown inside a fire engine and got a chance to escape from a smoke filled building! The girls, leaders and parent helpers were treated to a guided tour of the station, by Fire Fighter Mat Barney, Sittingbourne Watch Manager. The tour included the children being shown the vast array of equipment held on a fire engine and its many uses – like 101 uses of a casualty shield: protection from cutter; visual shield; casualty slide; sledge and Dumbo ears to name just a few! Fire Fighter Barney also told the girls how to contact the Fire Service and explained that Fire Service is one of the four emergency services. When he asking the girls to name the remaining emergency services, one girl replied to the question “What is the fourth emergency service?” with the answer “The AA” - Oh the power of advertising! During the visit the group was lucky enough to experience one of the fire engines being called out on a real life ‘Shout’. The girls stood flat against the wall while the fire fighters rushed from all directions, pulling on trousers and boots or shrugging on tunics. As the engine roared out of the bay the girls were allowed to chase after it and watch as it tore up the road with blue lights flashing and sirens blaring. Later on, the girls were shown how to find a water hydrant in the street and how the fire service can use it for extra water when out fighting a fire. The highlight of their evening was being shown the training house where the importance of working smoke detectors and planning an escape route was explained, while the building quietly filled with training smoke. Assistant Leader Karen Cook said “It is quite surprising how quickly you cannot see!” The Rainbows and Brownies then had the opportunity to put into practice what they had just been told. Fire fighter Barney was very patient, answering a range of questions (not all relevant) asked by curious Rainbows and Brownies. The two groups are now looking forward to using what they have learnt while working on the Fire Safety or Rainbow Jigsaw Learn badges during their weekly meetings over the coming weeks.